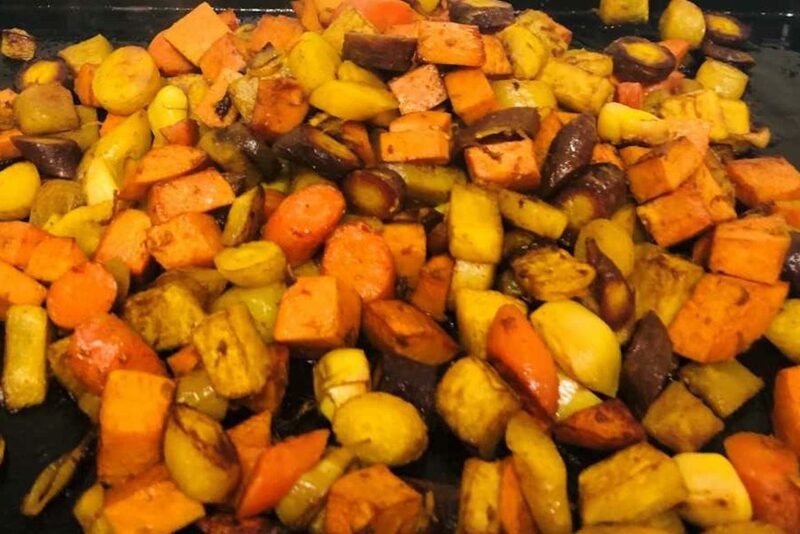 One of our favorite ways to incorporate vegetables in our diet is to roast them – not only is it easy to prepare, it’s also delicious! “Adding a variety of herbs, citrus, and spices is a great way to keep things interesting,” says Attune Health nutritionist and research associate Natalie Fortune. We recommend also playing around with the vegetables you use to add a whole new dynamic to the dish. This recipe isn’t just tasty, however – it could also potentially help with inflammation. Several studies have demonstrated that curcumin, an active ingredient of turmeric, can potentially help with pain and inflammation caused by rheumatoid arthritis and osteoarthritis. Experiment with this dish, and see what combination suits you! While the oven is heating, place all of the diced vegetables on a baking sheet. You want the pieces to be all the same size. Add the oil, garlic, vinegar, zest, ginger, turmeric, and sea salt, and toss evenly to combine. Spread the vegetables around the baking sheet until they are in a single layer. Roast for about 30 minutes until the vegetables are tender, fragrant, and beginning to brown. Serve with your favorite fish, poultry, or meat!